Adrenalin Junkie take note! 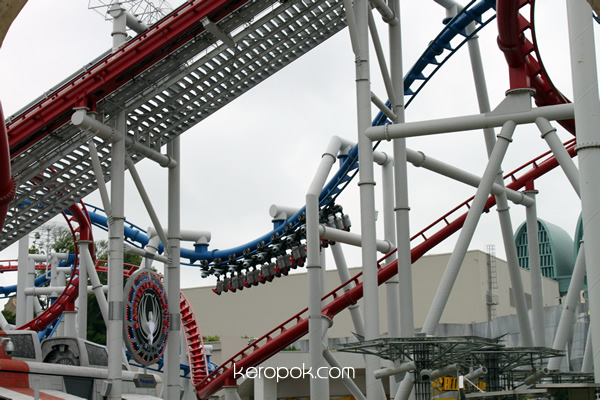 Battlestar Galactica re-opens! I was at Universal Studio just before Chinese New Year with my brother and his fiance. Guess what I saw? A sign at Battlestar Galactica saying it will re-open soon, they are doing test cycles. Suddenly I heard some sound from above. I looked up at saw that they were testing the rides! Can you see Battlestar Galactica: Human (on the red track)? 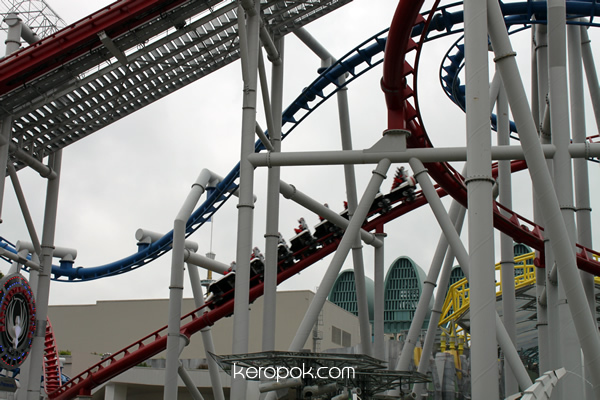 As an Universal Studio Singapore Annual Pass holder, I got an email invite asking us to go for the ride before it reopens to everyone on 21 Feb 2011. Tomorrow (Friday) and Saturday night, annual pass holders will be the first few to scream their lungs out! Which do you think is more fun or scary? Human or Cylon? My brother was so unhappy that this attraction is only reopening when he is now back in UK.